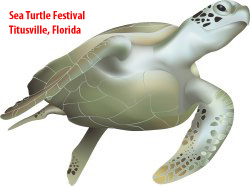 Largest of the sea turtles with a carapace that is rubbery, scaleless and black. The shell is raised into seven narrow ridges that extend the length of the back. The limbs, head and back are often marked by white, pink, or grey blotches. Unlike other sea turtles, the leatherback has no claws on its flippers. Adults weigh 700 to 2,000 pounds / 4 to 9 feet in length. Hatchlings: 2 ½ inches long. Age at maturity range from 8 to 15 years. Nest in Florida from March through August. Diet of soft-bodied animals such as jellyfish. Food is sucked into the mouth by expanding the large throat. The leatherback's jaws are scissors-like and the mouth cavity is lined with stiff spines that point backwards and aid in swallowing soft prey. Turtles equipped with depth recorders dove to over 3,300 feet deep. This depth exceeds that reported for any air-breathing vertebrate with the possible exceptions of sperm whales and elephant seals. Leatherbacks do not have a rigid breastbone or lower shell like other sea turtles so the chest may collapse during deep dives. 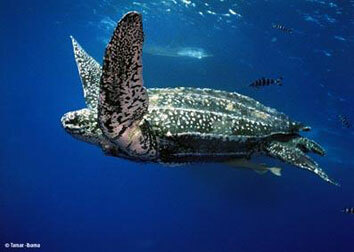 The large amount of oil found in leatherbacks may help prevent decompression problems during diving and resurfacing. The largest leatherback ever recorded was almost 10 feet long from his nose across the curve of the shell to his tail. One of the largest living reptiles, surpassed in size only by some species of crocodiles. The leatherback is the largest of the sea turtles; it travels the farthest, dives the deepest, and ventures into the coldest water. Nesting in Florida has moderately increased in recent years. 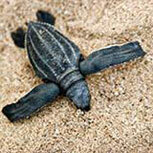 The number of leatherback nests recorded in Florida currently ranges from 200 to 550. 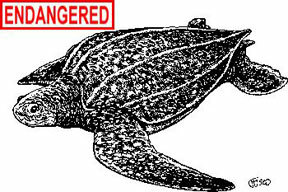 In 2001, Palm Beach County counted 334 leatherback nests, a record number for this species in the county. Many leatherback turtles die from ingesting helium balloons and plastic shopping bags floating in the ocean mistaking these for jellyfish. There is no mistaking the crawl-pattern of the leatherbank. Nesting females leave large, tank-like tracks in the sand.